Ok, I just wanted to say first and foremost that this blog looks absolutely fantastic. Congrats, Christina! Really. Do you happen to offer some tips for those of us not so blog savvy? Haha. Then, I’d like to invite you all to check out my semester project blog NYC For The Rest Of Us (Does anyone get the Seinfeld connotation or am I just a lonely Seinfeld geek? Festivus, anyone?). I want to ask you all to send me suggestions, tips, ideas, opinions, or any feedback for that matter is more than welcome! This week’s post is on yoga. God/ It's important to show you what life is all about from an early age, right? 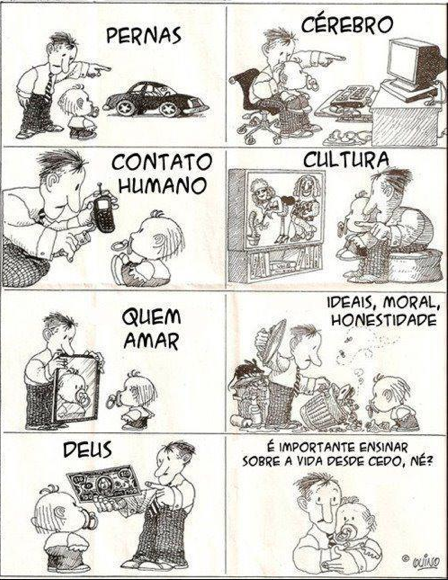 I found this cartoon on a Brazilian website, and although it is in Portuguese I thought it was too perfect to not post, especially based on what we talk about every week. The translation is below the cartoon which, by the way, was done by famous cartoonist Quino, the author of the famous Mafalda series. Have we come to a point where all our interactions and learning processes are mediated through something digital? To me, it is so hard to see a cartoon such as this that is so real and hits so close to home but at the same time is so unbearably sad. What have we come to? The truth is all there. Money dictates how we live. We are trapped by money, by the media, by technology. What is left? Wow, this is starting to sound like a really depressing blogpost. But it really did trigger in me a chain of reflections about how we, as a society, live. I really hope that, at least in terms of technology, our dependency on it will someday lessen. Who knows. As for now, we can get a laugh from this cartoon! My semester project, up and running! PS: Any blogging advice is also very welcome! Semester Project: Healthy and Cultural in NYC…. on a budget! As a student in Manhattanville, a school fairly close to the city, I have noticed that a lot of my peers don’t take advantage of the city. Maybe some simply don’t identify with it. But, at the end of the day, many don’t go because it is an extremely expensive city. For my semester project, I want to combine my admiration for the city with my passion for two things: living a healthy lifestyle and the arts. Therefore, I will have a blog that will be updated two times a week about being healthy and cultural in NY on a budget. Ideas for dining, going to exhibitions, festivals, among many other examples, will be offered. Essentially, I am making a blog that I feel needs to exist. There are so many ways that students can enjoy NY to the fullest without spending a lot of money, and my job will be to show them how to do so. My goal with this project is to generate interest in students, especially from Manhattanville, to make the best out of their time here, with a city like this so close to them. I want students to truly take in what the city has to offer without creating a dent in their bank accounts! Last week’s On The Media discussion about how Hollywood cannot seem to faithfully depict a newscast triggered a long and intense thought process in myself about my own film pet peeves. As they explained how Hollywood can make gun shots and wars seem so incredibly real yet simple newscasts so fake, I realized that there are also a lot of little things that make me nervous. For one, I hate movie rain. Not only do I hate the fact that they usually use rain in very dramatic scenes, but I really don’t like the physical aspect of studio rain. It’s always a torrential, pouring kind of rain, and you can easily see it is only being directed at the characters. Also, why does every main female character in a Romantic Comedy film have to have a lonely, funny, sometimes geeky-with-no-love-life-of-her-own best friend? I don’t get it. Or why is the romantic object of any hero in an Action film kidnapped? I understand these fixed roles sell movies… but Hollywood can afford to mix it up a bit, can’t they? But, please, don’t get me wrong. The magic of movies will never leave me. There are things that blow my mind every time. For instance, I can never get enough of scenes that have few camera cuts. These long, progressive takes are so real and demand so much from the actors and the crew that I applaud each time. I can go on and on. But now a newscast in a movie for me will never be the same. I cannot get over the fact that, in 2012, we still have Republican candidates discussing the right to birth control. As the Washington Post noted, the Republicans have a “fascination with reproduction at a time when economic production is what voters have in mind.” Why are they so obsessed with this topic? To me, it’s just a form of drawing a wedge between them and Democrats in this election. In all, the GOP candidates are focusing so much on the right to offer contraception, a subject that has not been controversial (with the exception of the Catholic Church) for a very long time. Some even call it a “Republican War on Women.” I tend to agree. The worst part for me is that Limbaugh is heard and followed by millions of people. In turn, these millions of people are directly influenced by what he says. We have much more important issues to discuss. As a matter of fact, this shouldn’t even be one of the main issues of the election in the first place. All I can honestly say is I hope the majority of people see through him and these issues. I hope we, as a nation, are able to move on and realize that this is a right to all women. I hope that a Republican doesn’t win, because– regarding this issue– that would mean the loss of federal funding for Planned Parenthood, the condemnation that birth control is a required health benefit, among others. And, yes, I do hope that one day ignorance such as Limbaugh’s disappears. One can dream right? I went to a Broadway show this weekend and I realized something very important. Media can converge and advance as much as it wants, but it will never be able to take away the power, the force, the effect of a live performance. That, thank goodness, will never change. A huge part of what makes Adele, well, Adele is the emotion that she projects through her music when she is singing. Last week’s On The Media had an interesting perspective on how her music’s composition is and how it is perfectly projected to catching our attention and keeping us involved. Don’t get me wrong, I thought this explanation was fascinating– especially in its comparison to the Moonlight Sonata– but to only remark on the impeccable composition of her music was, in my opinion, not enough. What about the actual lyrics, that everyone can relate to at one point or another? What about the simple yet eloquent performance she gives each and every time she sings? To me, she is one of a kind. And I agree completely with what they said: her music will be around for a long time. I also want to comment on Russia and how in 2012 we’re still talking about censorship in a seemingly democratic country. I had no idea about Vladimir Putin’s commercials on his opposition leaders travelling nor that TV Shows could be cancelled in Russia if they spoke openly against the government. Russia, along with China, India and Brazil, is one of the most promising countries economically and it strikes me that there are still issues such as there. PS: By the way, isn’t the presenter, Brooke Gladstone’s, voice so lovely?